Laurie: Hi, this is Laurie McCabe from the SMB Group, and today I’m talking to Janine Popick, CEO at VerticalResponse. VerticalResponse helps small businesses grow with email and social marketing tools, and recently Vertical Response introduced a new version of their solution which is what I’m here to talk with Janine about today. So Janine, before we get into what the new VerticalResponse solution is all about, can you just let us know a little background about the company and what you’ve been doing up until now. Janine: Oh sure, and thanks for having me here, Laurie, this is great. I launched VerticalResponse back in 2001 really with the premise that there was a lot of email marketing solutions out there for big businesses but there’s not a lot of solutions for small businesses. We’re based in San Francisco, we’re still headquartered here today, but really those big companies have that expensive software to manage all of their marketing, especially their email marketing. It was the right time for us to launch a company and get those small businesses from sending email out of their Outlook to more professional looking emails and a more professional solution. Currently here we have about 105 current employees at VerticalResponse. Laurie: Ok, and about how many customers do you have? Janine: Well we have over a million businesses that have come to use us over the course of the last 13 years. We’ve got probably on any given month about 40 to 50,000 active customers that are in there using the system. Laurie: Ok, thanks. That’s a great introduction too. 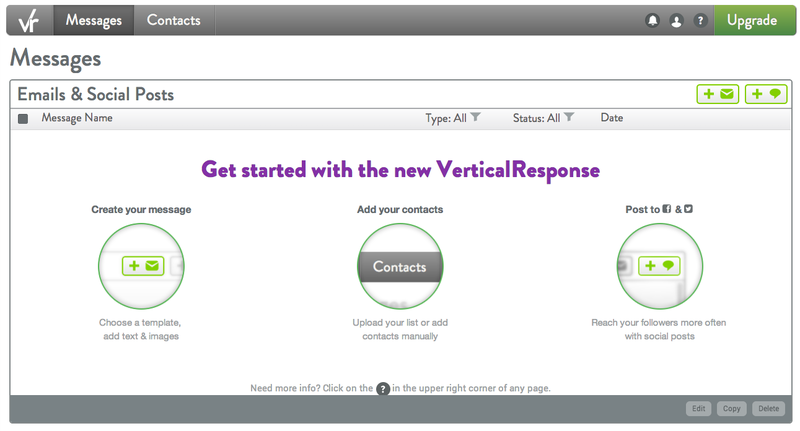 So why are you introducing a new version of VerticalResponse now? Janine: Well, over the course of years newer technology surfaces so that companies like VerticalResponse can build some really neat stuff for small businesses to use, easier to use technologies, and we really decided it’s time for us to do that. Our self-service platform really lets those small businesses connect with their customers using both email marketing and social media marketing. Laurie: Right, I did get a look at it last time we spoke and it does look really easy to use, which is always a good thing for any of us. Janine: Yeah, you know small businesses really want to get in there and get out and do what they do best which is running their business. Laurie: Exactly. Who would benefit from this? Is it your existing customers, is it new customers? How will it help them? Janine: Well definitely new customers and existing customers. It really solves lots of problems but two that come to mind are time and money. Right? So with VerticalResponse these customers can keep in touch with their customers through the email marketing and social media marketing without spending, like you said you thought, without spending a lot of time to learn a complicated technology. This new platform has lots of amazing features. We really focused on drag and drop designer and with that drag and drop come templates that are mobile friendly. We’re really over 50% of all consumers today are checking their email on their mobile phone or on their tablet, so we really put an emphasis on mobile friendly templates, but you can also post messages to Twitter and Facebook right from the same dashboard, so you don’t have to log in to all those different platforms to do your social media as well, it’s kind of like that nifty one-stop shop for email and social. Laurie: Right, and that’s very convenient. Also, if I remember correctly, once you create your email marketing campaign it will render across any of the mobile devices or somebody’s laptop or desktop without you having to do anything different to it. It’ll render correctly, right? Janine: Absolutely. We really wanted to take all that guesswork out of it for our customers who are the small businesses. Laurie: Yep, make it idiot-proof. How about for the customers using the original version that you have, are there any gotchas? Should they switch to the new version or is it something they need to kind of look at some trade-offs or what? Janine: Well I think at the get-go they should look at the new version, especially if they have under a thousand contacts on their list, it’s free, the whole product is free. That’s one benefit for our current VerticalResponse customers. Over the course of the next two to three quarters, we’re going to be incorporating all of the features that most of the Vertical Response current customers are using into the new platform in an even better and easy-to-use way. As those features come available we’re going to be communicating to those customers that use and love those features that hey, they’re available in the new Vertical Response, come on over and start using them. So that’s pretty exciting for current VerticalResponse customers, I think. Laurie: Yeah, definitely, so kind of get your feet wet now even if it’s not got every bell and whistle that you want, it will have it and you can learn it and be ready when it’s all available. Laurie: So right now the new version is completely free or is it a freemium kind of model where there’s an up charge or how does that work? Janine: Well it is a freemium model, it is completely free if you have a thousand or fewer customers. Once you go over the thousand contacts on your list it’s as little as nine bucks per month, depending on your list size that’s where it starts. It is completely free but as soon as you start growing and you might want some more bells and whistles, then we’ll ask you for a charge. Laurie: Yes, sure, typical freemium model. What’s your URL, what’s the website address where they can learn more both about the new product and maybe the existing one too? Janine: The website is www.verticalresponse.com, they can go, they can sign up right then and there and begin trying it out. It’s pretty easy, they get in there and just try it out and see if they like it. Laurie: When did you put it up there for people to start trying? Janine: On the 14th of March. Laurie: Ok. Have you had a lot of hits or how’s it going with that? Janine: We have actually. We have the most sign ups that we’ve had over the course of many years, which is just great to see. We think it’s catching on, we think people like it and it’s just going to keep growing, so we’re pretty excited about what we’re able to offer to our business customers. Laurie: Ok, well that’s great, Janine. I really appreciate your time today and thank you for joining us to share the information and the news.